This pair of Mars Global Surveyor (MGS) Mars Orbiter Camera (MOC) color images shows early autumn clouds over the Arsia Mons volcano, plus the shadow of the innermost of the two martain moons, Phobos. 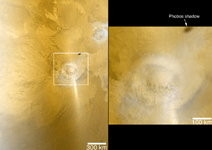 The picture on the left is taken from the MOC daily global map acquired at 7.5 km (~4.7 mi) per pixel on 28 January 2006, about a week after the start of southern autumn. The picture on the right was taken at the same time, but at a higher resolution of 489 m (1604 ft) per pixel. 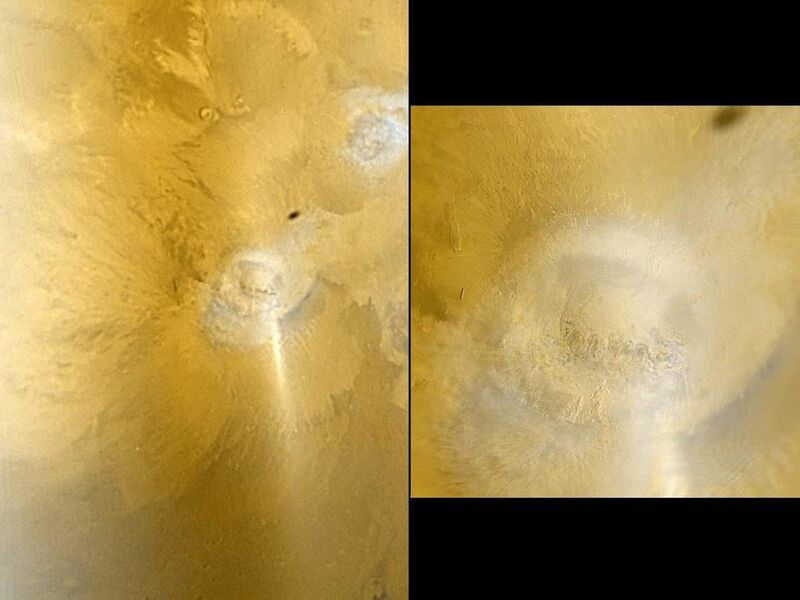 Both pictures are composites of MOC red and blue wide angle images, and both are oriented such that north is up and east is to the right. Arsia Mons and the other large Tharsis volcanoes commonly develop afternoon orographic (i.e., topographically-controlled) water ice clouds at this time of year. The equatorial Tharsis volcano, Pavonis Mons, is also under a deck of water ice clouds; it is located toward the upper right corner of the left, lower-resolution image. 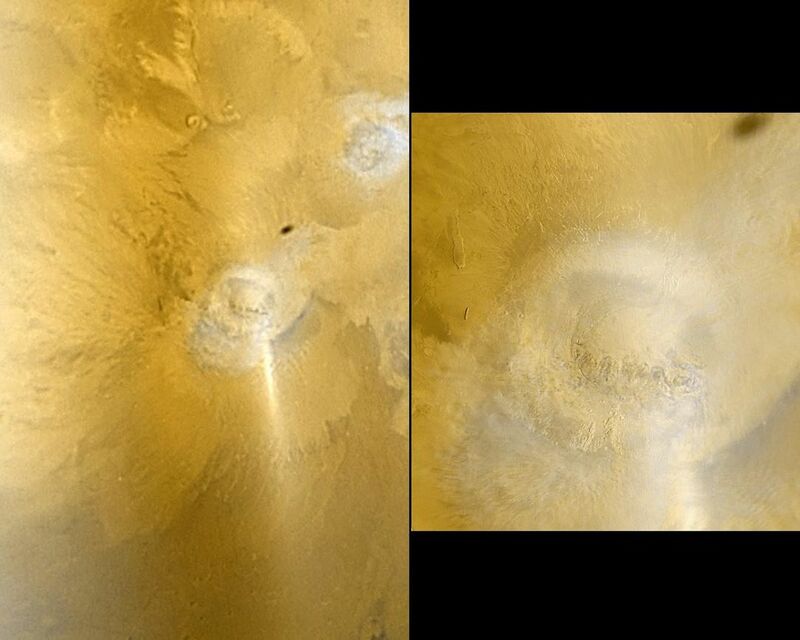 Sunlight glints off the dusty surface and the clouds and aerosols in the atmosphere, producing the bright diagonal streak located just southeast (lower right) of Arsia Mons. A water ice haze is seen on the left side of the lower-resolution image. The dark oval to the northeast of Arsia Mons, as noted above, is the shadow of Phobos.